Urban Video Project and Light Work have announced the exhibition of the new video piece “Platonic,” created by up-and-coming multimedia artist Dani Leventhal during her summer residency at UVP. The UVP Everson exhibition will feature a special cut of “Platonic” from Sept. 12–Oct. 26. The uncut version, set to premiere at the New York Film Festival this October, will be screened during Leventhal’s artist talk, along with other selections from her body of video work. Leventhal will give an artist talk in the Everson’s Hosmer Auditorium on Thursday, Oct. 17, at 6:30 p.m. as part of Third Thursday (Th3). In Leventhal’s “Platonic,” geometric specters twirl in space, pet cats foam at the mouth and a little boy mistakes his junkie dad for a superhero. “Platonic” references both the eponymous philosopher’s metaphysics of ideal forms, which simultaneously exist outside our perceptions and yet give rise to them, and the related meaning from common parlance of non-romantic love. Leventhal trains her searching lens on the distance separating bodies, moments and perspectives. The result is a study in the awkward gaps between appearance and reality, seeing and understanding, desire and its object. Leventhal studied sculpture at the University of Illinois at Chicago and received an M.F.A. in film/video from Bard College. She received the Visual Arts Award from the Astraea Lesbian Foundation for Justice and produced a limited-edition book and video, “Skim Milk and Soft Wax,” at the Women’s Studio Workshop with the support of the National Endowment for the Arts and the Andy Warhol Foundation. Her work has screened widely, including at the Ann Arbor Film Festival, Views from the Avant Garde at the New York Film Festival, the Rotterdam Film Festival, the Gene Siskel Film Center as part of Conversations at the Edge and at MOMA P.S. 1 in New York City. Her videos are distributed by Video Data Bank in Chicago. Her work is included in the MOMA permanent collection. In 2011, she received the Wexner Center for the Arts Capital R Award. Leventhal was born in Columbus, Ohio, and teaches there at The Ohio State University. UVP is a multimedia public art initiative of Light Work and Syracuse University that operates multiple electronic exhibition sites along the Connective Corridor in Syracuse. UVP Everson, a partnership with the Everson Museum of Art, is UVP’s flagship site. UVP Everson is located on the north façade of the Everson Museum of Art building at 401 Harrison St. and runs commercial free from dusk to 11 p.m., Thursday-Saturday, year round. 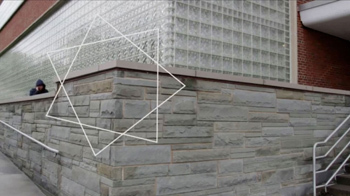 Light Work Urban Video Project from Syracuse University News on Vimeo. For more information about any of these exhibitions, contact Anneka Herre at UVP, 315-443-1369 or anneka@urbanvideoproject.com.